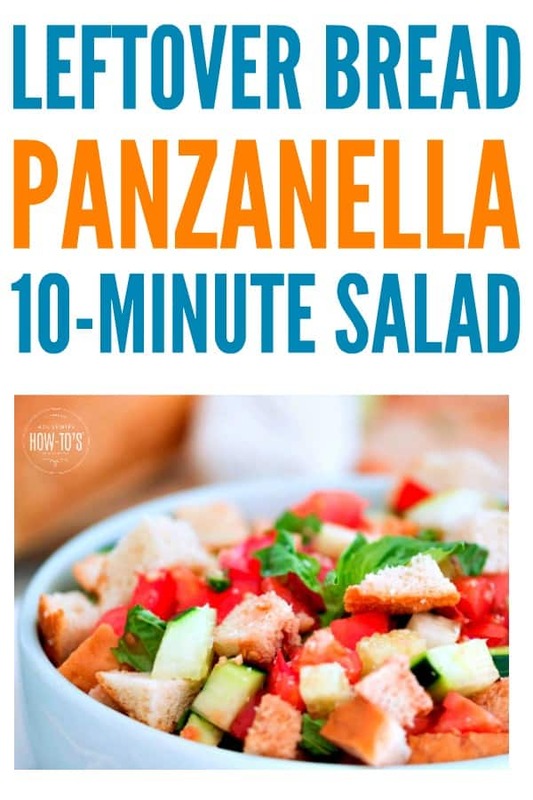 I’ve mentioned this Panzanella Salad recipe is a great way to use bread heels. It’s also a delicious way to get your family to eat their vegetables, too! 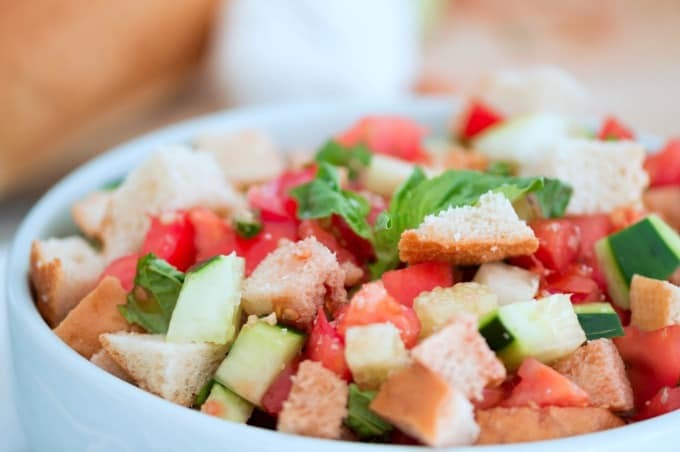 A staple of Tuscany, Panzanella Salad is often referred to as a bread and tomato salad.The name itself is a combination of the Italian word for bread (pane) and for the soup bowl in which it was served (zanella). That should tell you that using plenty of vinaigrette and bread — not croutons, and not toast — are essential to this dish. Like many great recipes, it originated as a thrifty way to use leftovers rather than throwing them away. 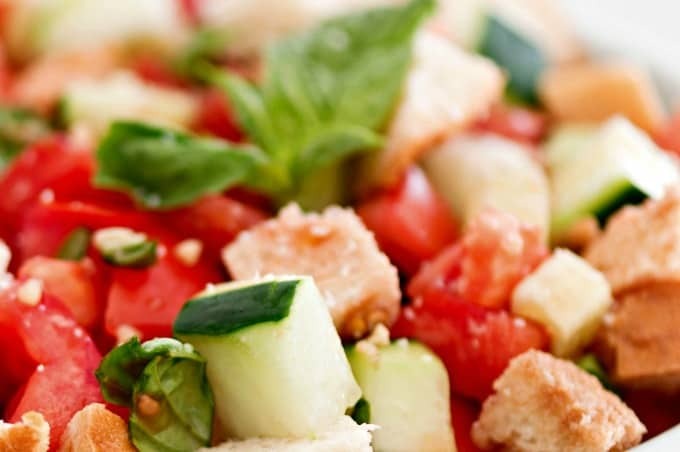 While just about every region of Italy has its variation, the original Panzanella consisting of bread, onions, oil, and vinegar has been celebrated for centuries. In the 16th century, when this salad was first mentioned, people baked their bread once a week in large batches to use throughout the week. Not surprisingly, the loaves were a bit tough toward the end of the week and yet so much time and effort had been put into baking them that they were too precious to throw away. Really, the variations are endless so long as you include bread, oil, and vinegar. 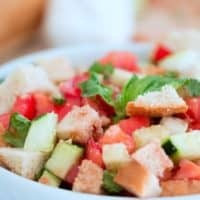 To get a jump start on this Panzanella Salad Recipe you can chop or tear the bread into chunks ahead of time, so they have a chance to dry out thoroughly. Make the vinaigrette ahead and toss it with the onions and they’ll soak up each other’s flavors. Chop the tomatoes and cucumber ahead if you like, but don’t combine them with the other ingredients until you’re ready to serve. Since this recipe is designed to use bread that’s already past its prime, it doesn’t store well. If you do want to keep it for more than one day, leave the bread out. Just before serving, combine the bread with vinaigrette and stir that into the leftover salad. 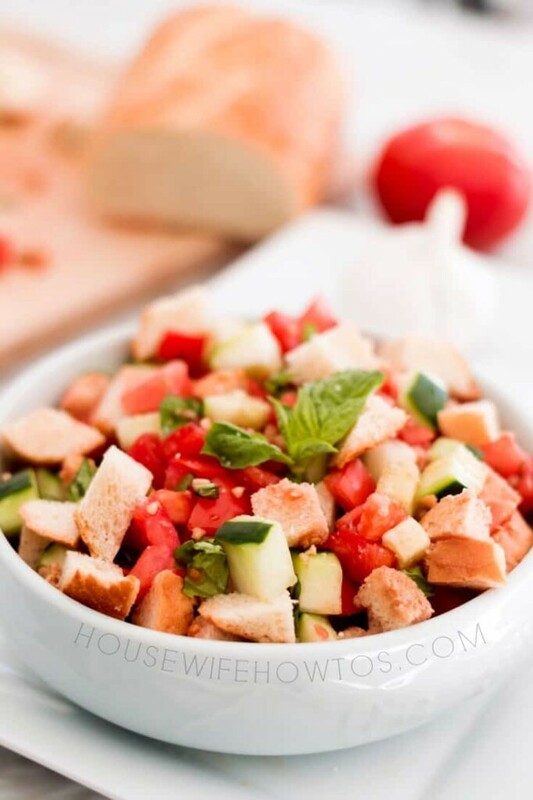 A great way to use leftover bread, this Panzanella Salad is full of vegetables and delicious flavor! Make it a main course for a meatless night, or keep the bread separate to serve it throughout the week. In a small bowl, whisk together the garlic, mustard, vinegar, and olive oil. Add the juices reserved from chopping the tomatoes. Taste, and add salt if desired. Set aside. In a large serving bowl, combine the bread and onions with half of the vinaigrette. Toss well to thoroughly coat the bread. Let sit 5 minutes so the bread softens. Add remaining salad ingredients and the rest of the vinaigrette. Serve immediately. To make ahead: Double the vinaigrette and combine half with the vegetables. Refrigerate. Before serving, toss the bread with the remaining vinaigrette in a separate bowl and let sit 5 minutes. Combine with the vegetables and serve. To use fresh bread: Spread cubed bread evenly over one or two baking sheets and bake in a 275°F / 140°C / gas mark 1 oven for 10 minutes, stirring halfway through. Remove from oven and let cool. Proceed with the recipe. They’re great on sandwiches, too! Looks so good. Pinned & sharing. Thanks for sharing at the Inspiration Spotlight party @DearCreatives See you again soon.